"Providing superior service & equipment to the expanding needs of the oil patch"
Oilfield Marine Contractors has provided superior services and equipment to the oil and gas industry since 1995. We specialize in providing commercial boat rental and marine transportation services to many industries throughout the United States. The key to our success begins with the relationship we develop with our customers. Their continued trust in our ability to deliver superior service within the time constraints at hand serves as our motivation for continued success. Our reputation is one we have worked hard to build! We have a fully staffed service department consisting of mechanics and fabricators. Our service team enables us to provide fast on-site service anywhere, at anytime. We do both bare lease and boat rental with captains. We carry a comprehensive marine insurance policy with limits above industry standards. 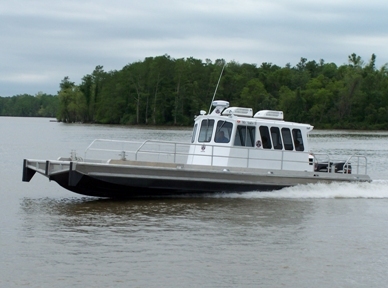 Oilfield Marine Contractors is located in Lafayette, Louisiana at the heart of the oilfield service industry. Our ever-expanding equipment lineup currently includes a fleet of over 50 boats. Click on the equipment link at the top of the page to view pictures of our lineup which consists of airboats, deckboats, crewboats, gunboats, and other specialty marine equipment.